The global financial system is empty of ideas, has no solutions, and is rotting on the vine. The solution is a new trade payment system centered upon Gold, no longer on the toxic USDollar. The solution is a banking system that turns its back on USTreasury Bonds, the delinquent foreclosed step-child of the US Federal Reserve. The list of extreme symptoms and hidden menaces is as long as a roll of fiat toilet paper. It reads like a bad novel, like an endless nightmare, like an obituary. The distortions are far past extreme. The United States is locked in a trade war with China, the financial battles played out in the financial ministries and the press, the actual hot war played out in Southern Africa among smugglers. All Chinese investment within the United States has been secretly banned. The dependence upon Plunge Protection Team props and High Frequency Flash trading to keep stocks up is extreme. The phenomenon is reported regularly, but is no longer news since it is engrained as a constant feature. The charred financial and economic landscape has transformed so radically since 2008, that aberrant distorted disconfigured bizarre and twisted are considered as normal. The nation has become a surreal depiction economically, financially, politically, and ethically in the last decade, since September 2001. The former USFed Chairman Greenspan was wise to walk away and retire with laurels from knighthood. His work was done. The Bernanke Fed will be known as the Weimar engineers and Mafia bagholders. Even Greenspan could not image the extreme measures required by the central bank, with assorted liquidity facilities (none worked), TARP Fund enabling (pure bait & switch deceptive fraud), hidden bond monetization (drained fuel), bloated toxic balance sheet (never to find value), massive narco money laundering (fully dependent for survival), rafts of mortgage lawsuits (motive for QE3), rising food & energy costs (painful consequence), and much more (not reported in the subservient financial press). Review some of the extreme features that serve as prevalent signposts scattered across the American landscape, none of which existed in the 1990 decade. The US is stuck in an end road heading over the cliff. Many like the Jackass argue that given the profound widespread insolvency, the nation is descending after having gone over the cliff. It is not approaching a fiscal cliff. It has fallen over it, ever since the Budget Super Committee formulated by the USCongress disbanded in utter failure on the public stage with zero progress on anything. The USGovt spending is so out of control, the political process so broken, that the fascist collectivist nation could not make a New Politburo council work. The broken financial apparatus should be more recognizable. Spending is rabid out of control. The bond monetization is the only defense to prevent a USGovt debt default. The ZIRP birds chip at 0% frequency, due to interest rate derivatives working around the clock under great strain, with no buyers and $trillion deficits as far as the eye can see. The national perspectives are usually late in coming. Eventually the broken national machinery will be understood and perceived. The pundits and experts did not notice the subprime mortgage crisis until 12 to 18 months after it struck. They spent the following year denying its crisis and wreckage. The pundits and experts did not notice the housing market bust until 12 to 18 months beyond peak. They spent the following year denying its crisis and wreckage. Perception inside the United States is not a strong suit. Accurate perceptions are almost considered unpatriotic. The ultra-low near 0% interest rate environment is a massive wet blanket on the USEconomy. The Zero Interest Rate Policy has an undercurrent to makes for higher costs, lower profit, business segment shutdown, job cuts, and lower income. It remains the biggest blind spot among US economists, whom the Jackass has very little if any respect for, deservedly. The absent foreign bond demand provides a constant motive to conduct the next QE program. The dependence upon monetization to finance the USGovt deficits is slowly entering the mindset of financial analysts and investment managers. The QE3 should be called Global QE or more accurately QE to Infinity, since all the major central banks have joined, whether out of enthusiasm or pressure. They wish to avoid a currency war, so a coordinated currency debasement is the active plan. That approach leaves them all vulnerable to simultaneous rising commodity costs, only kept down by a deteriorating economic base. Such is the bitter fruit of failed central bank franchise systems. Witness the unlimited USFed and EuroCB and Japanese bond purchases, to prevent a collapse. The Interest Rate Swap device is heavily used to hold down USTBond yields, amidst unending $1.4 trillion annual deficits, low bond demand, and lost global prestige. The hidden motive for the next QE3 round is to cover bury and remove the mortgage fraud that acts as a gigantic logjam on the financial structure and foreign flows. The criticism grows on the theme of questionable quality of new money, the toxic paper to replace toxic paper. The frustration grows on the theme of better quality and higher subordinated debt to replace toxic debt. Solutions are nowhere. The USEconomy has been stuck in a powerful recession of at least minus 3% since 2008, with only extreme statistical gimmickry and outright accounting fraud to pull up the reported growth. The only sector with rising profits is the banking sector, due to USFed bond purchases, due to the easy USTreasury carry trade, due to the accounting fraud on mortgage portfolios (still no mark to market), due to the lack of derivative contract accounting altogether, due to the convenient debt value adjustment scam. The short home sales are not adequately counted in housing market price data, enabling the charlatans to claim a recovery just in time for the presidential election. Shiller seems like a dope with his blind eye to the excluded short sales in the index that bears his name, and to the racked up home inventory from foreclosures. Hundreds of thousands of homeowners do not pay anything on monthly mortgage, the new scoff-law crowd. They are increasingly challenging the big US banks to produce title, a story the press does not cover any longer since so volatile and visceral. The Federal Housing Admin (step-father to Fannie Mae) has quietly ramped up subprime home loans, but all under the USGovt auspices. The 3% or 5% down payments are no problem for loans. Step right up. The car market is propped by the next subprime push, with banks practically ordered to extend easy loans to buyers. Some loans are for seven to eight years, and go negative equity in the first few months. The crude oil price remains over $90 per barrel despite a powerful entrenched recession, due to USDollar hedging. Tangible investment stubbornly remains a fixture in global portfolio management, as distrust for the USDollar continues. The deadly decline in California state sales tax receipts, down 40% from July 2011 to July 2012, in my view serves as the most deadly of highly visible signposts. The land of rotten fruits and bitter nuts is being racked by gasoline shortages. Nowhere is the damage to the US systems more visible than the labor market. It is hard to hide millions of jobless workers. It is hard to hide the shuttered factories whose business went to China and the Pacific Rim. The jobs data is an exercise in deception and fiction. The deception is with the unemployment rate, which runs steadily at 16% to 17% even on the official U6 statistic, but runs steadily at 22% to 23% in the Shadow Govt Statistics that reflects the world in which we live. The deception is with the jobless claims data, since 99 weeks is the limit, and millions of workers have passed the limit, unable to collect more insurance, no longer counted in the official reports. They are like abandoned Missing in Action soldiers left behind to rot in Vietnam, denied to exist, suffering still. The fiction lies with the Birth Death Model, transformed into the main new employer in fantasy land, lifting the Jobs Report. Several hundred thousand new fictitious jobs appear almost monthly, surely to be corrected in March when nobody is looking. Most of what the President claims as job growth is derived from the BDModel, complete with Cheshire Cat as the guard in a Wonderland. The National Federation of Independent Businesses routinely contradicts the official USGovt propaganda about a robust small business sector. The Birth Death Model is designed to factor in the missing small businesses from the sampling process. It has become a fudge factor to the extreme. Around 50% of new college graduates cannot find work, deeply frustrated and disillusioned. Over 3 million young people are fast losing faith in the system, adults living with parents. They will serve as the demonstrators on the street, if the nation ever wakes up. The nation of Spain had 2500 demonstrations in 2011 that took place in Madrid alone. The United States is fast asleep, flouridated, awash with propaganda, deceived in almost every area of life. Notice how the narco and oil wars are off limits for discussion and debate. Soldiers are recruited from the poor parts of the archipelago of troubled cities and towns, with hope of income and job opportunity, maybe college later, but with rising likelihood of a missing arm or leg where the benefits kick in. The war has an ugly statistic that the monger merchants cannot escape. More soldier suicides (active and retired) occur than battlefield deaths. The soldier corps is being depleted, as soldiers are ordered into endless returns of tours, victims of the fine print on induction contracts. The United States as a nation slowly abandons both the Constitution and Capitalism. The legal authorities have begun to brand advocates of the former as terrorists, and advocates of the latter as uncaring. The last chapter of any failed democracy is surely fascism. The dependence by US big banks upon narco money laundering for survival is becoming well documented, but still a secret inside the US. In the European corners and the United Nations, the dependence is well known. The Too Big To Fail mantra that supports and upholds the big broken banks is losing its luster and appeal. The tough questions being argued pertain to how to break up the big US banks, what parts to save, how to redeem their toxic balance sheets, where to merge their viable parts. Chris Whalen made some outstanding points recently, claiming that no Wall Street firm is earning money on their bond inventory. Their carry trade profits are down by over 50%. The big US banks in Whalen's opinion will break up from internal stresses, like basic lack of income and high operating costs that include bloated incomes. The nation has suffered massively from the merger of preferred big business and the state, the lace of fascism. The big corporations, led by the banks, are given license to commit financial fraud and open thefts. The list from MFGlobal, Peregrine Financial, hundreds of mortgage bond fraud cases, and thousands of mortgage contract fraud cases, litter the landscape for all to see. They are joined by new LIBOR lawsuits that will keep the courts busy for years, until laws are passed to forbid such lawsuits, decreed in the national security interest. Not so easily seen are the deep trenches of bond counterfeit, like with JPMorgan in collusion with Cantor Fitzgerald, whose handiwork was conveniently buried late in September 2001 in South Manhattan. The negative correlation between Exit Polls and precinct level president votes in 2004 and 2008 highlighted the vote rigging as stark statistical evidence. Any competent statistical analyst can see the anomalies, if attention is focused and eyes are open. Statistical analyses were easy for spotting the vote fraud, since the correlation for over 30 years had been over 90%. No longer is the correlation high in the swing states, where vote fraud is the new normal. This is a key trait of a Third World Nation, of which the United States leads in sophistication. Chavez in Venezuela has nothing on the White House victors. Watch Florida, Ohio, and now Virginia as the important swing states. These three states might not be enough, as the horrendous economy usually accounts for a sudden 5% swing against the incumbent. The USDollar being abandoned slowly in global trade. In the process the important currency is losing its prestige. After more isolation, its global reserve status will be lost in an expedience to bring about a solution to the pernicious relentless unforgiving global monetary war which is falsely called the global financial crisis. This is a war to defend both the USDollar and its merchants who rely upon fraud and war, an important ally being the Saudis, whose House has turned seriously unstable. What irony if the House of Saud were to fall victim to the Arab Spring sequence that was spawned by Quantitative Easing by the USFed and fast rising food prices. The Petro-Dollar defacto standard sits in the Saudi shrinking shadow. The USDollar will be surrounded, then isolated, then sink with the rest of the fiat paper currencies. The great Gold accumulation movement is fast underway, picking up speed. The New York and London bankers are in fast retreat, delivering their precious gold bars to Eastern entities, as they are being systematically drained of their gold assets. The New York and London bankers are seeking desperate measures to move Silver behind the curtains, in order to meet demands and avert a nasty default. They will not be able to avert a Gold or Silver default unless they conduct another MFGlobal account theft. Too many are watching for such a theft. In the process, the derivative machinery is straining, wheezing, and giving off burned oil smoke. The JPMorgan CIO strains have not gone away. Only the more vigorous accounting fraud has kept the strains, losses, and rot out of view. The priorities are clear. JPMorgan refuses to deliver Silver, choosing instead to steal accounts that seek delivery. Bear in mind that labor strikes and government confiscations are in high gear among gold mining firms in South America and South Africa. The trend bodes well for the physical Gold price, but bodes poorly for the mining stock share prices. The Jackass forecast stands firm, that the physical Gold price will suffer a significant divergence from the corrupted paper Gold price dominated by the futures contracts, where naked shorting is the permitted normal practice. In time the COMEX will not sell Gold or Silver futures contracts, since no precious metal in inventory. Anyone who expects the Commodity Futures Trading Commission to enforce the law, obstruct the naked shorting, reduce the outsized uneconomic commercial short positions, and prosecute private account thefts, well, is a moron at worst and a fool at best. The Gold price has been doing important technical work for the last month. On the surface the price movement looks boring if not weak, with lost momentum. That is typical of the brief phase when consolidation takes place, while building the right side handle. The downside risk is to 1720 (daily basis) or 1750 (weekly basis), really no big deal. 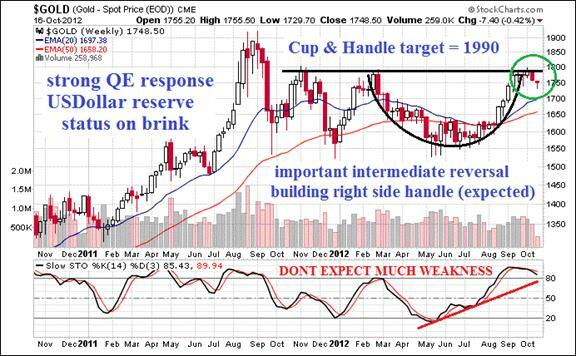 The recently announced and detailed QE3 initiative is incredibly bullish for Gold, providing the bull market the most wonderful fuel that is supercharged by the permanent 0% rate. The paper mache merchants who defend the indefensible broken USDollar are redoubling their naked shorting. It will not be enough. They must outlaw alternatives to the USDollar and force USTBond ownership. They cannot do so but they might try. Hence the Gold price will rise. The extreme Gold price breakout will be fast powered by the realization of the QE3 arrival, its unsterilized nature, and its much greater volume than previewed. The keys are both lack of sterilization and outsized volume. The USFed is fast running out of dry powder in USTBills, which means the bond monetization will be done with fresh money and not proceeds from sale. This is hyper monetary inflation of the worst order, akin to Weimar times. The volume of bond purchases within the QE3 framework will be between three and five times larger than announced. No rational bond buyers remain. Even the official bond dealers are facing extinction. See Cantor Fitzgerald, one of the biggest bond scum peddlers on the planet, a key accomplice for JPMorgan in the removal of both Enron fraud and USTreasury Bond fraud back in the dark days of autumn 2001. Their repository building fell in structural sympathy.